As you, my lovely readers are already aware, we are passing through the dinosaur phase at the moment. We have been reading Noisy Dinosaurs and we have been painting and playing with these intriguing creatures. 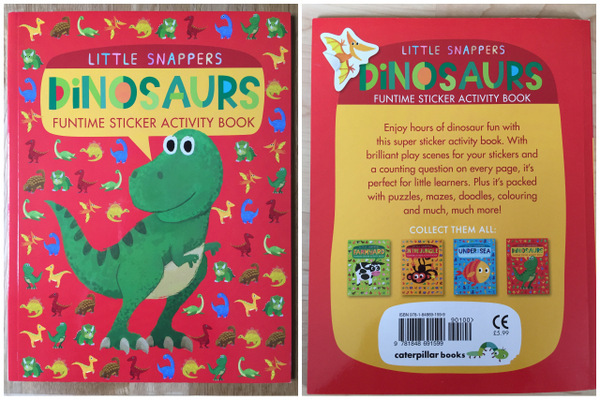 The dino theme continues courtesy of Little Tiger Press UK, who have kindly given us a copy of their Little Snappers Dinosaurs Funtime sticker activity book to review. As the name suggests, it is a book full of dinosaur stickers and fun activities aimed at early learning years. There are pictures to colour in and puzzles to solve. 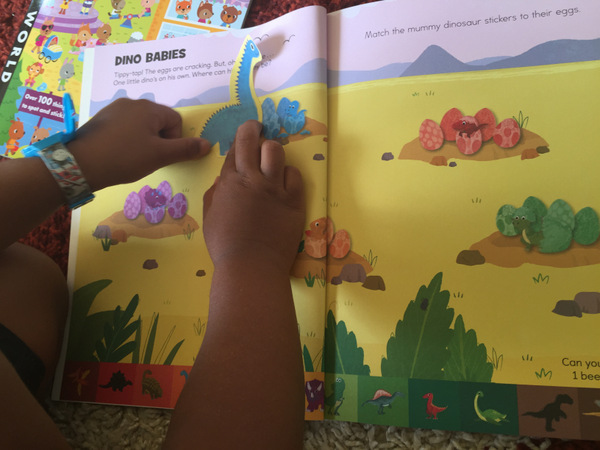 And there are pages upon pages of stickers that little ones can use to create dinosaur-themed scenes on brightly coloured pages. J has enjoyed it, and has even had a go at cracking a maze – a tricky task. He carried on undeterred, and managed to solve it with a little help from Mum. 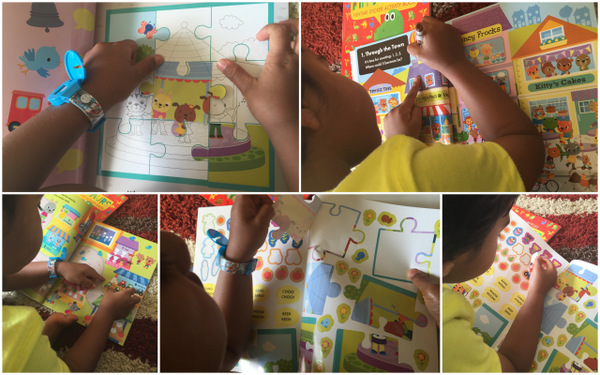 We have also been having loads of fun with the new release from Little Tiger Kids. This one is called I Spy Learn And Go. I think, and J concurs, that this book is absolutely fabulous. It has wipe-clean pages. 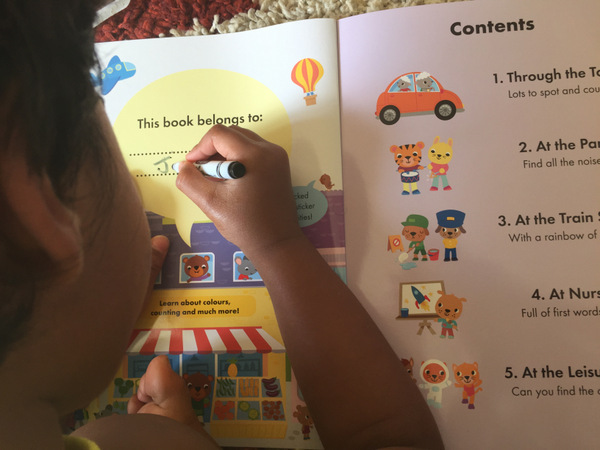 So we can use our erasable markers and keep going over the puzzles and questions again and again. 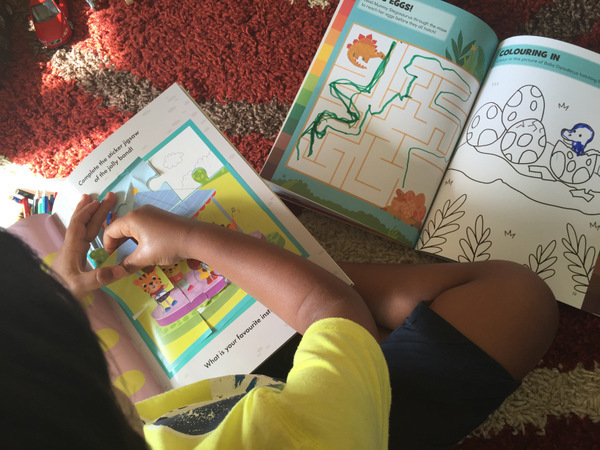 It works great for a rainy day or after a busy day at school when all you want to do is sit on the sofa and scribble together. It helps that it is full of re-usable stickers and the pages are so vibrant and colourful. 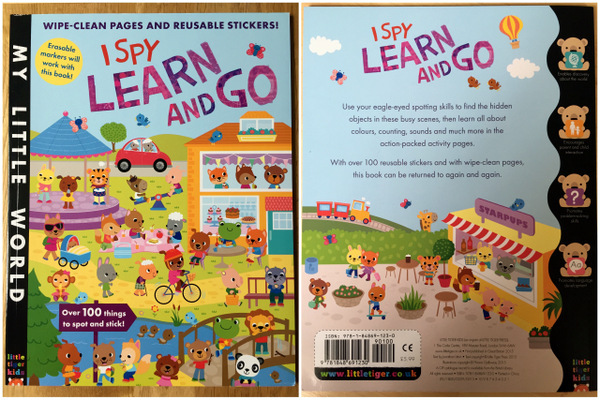 The book is based on the traditional game of 'I spy' and takes little ones on a learning journey through problem solving via play. There is counting, spotting, sounds and words. There is even a little sticker jigsaw, something we had never done before. J loved it! If you are looking to do some fun-based learning with your youngsters over summer, I would recommend taking a look at either or both of these books. They are sure to keep them amused. Disclaimer: We were given a copy of these books for the purpose of this review. All opinions are my own. Ohhh my little boy would love these books. I'm always on the look out for things like this. My daughter loves these kind of activities and enjoys doing them with Mum.